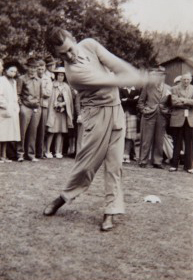 Mr. Hogan teeing off the old 1st Tee of Langhorne Country Club on May 10, 1941. Middletown Country Club is celebrating 106 years of tradition in historic Langhorne, PA. Operated by the Agro Golf Corporation, the club remains one of the most popular layouts in Bucks County. Originally founded as the Bucks County Country Club in 1901, the original course was a rudimentary 9-hole course that was located on the opposite side of Pine Road (Route 413). As the membership numbers swelled, the club saw the need to move to its current location in 1913 with the cornerstone of our current clubhouse dedicated on July 4th, 1913. The rolling course layout was designed in 1913 by Scottish architect Alexander Findlay, who laid out 9 holes that year with another nine being completed in 1916. Twelve of his original holes are still played to this day. Findlay was known as “The Father of American Golf”, designing over 200 courses throughout the country, with 32 courses in the state of Pennsylvania alone. Findlay designed familiar courses in the Philadelphia area such as Tavistock, Medford Lakes, Burlington, Doylestown, Llanerch, Yardley, and the original Aronimink Country Club. He also contributed to golf for the masses, as the game in the Philadelphia area was exploding prior to the Great Depression. He designed current Philadelphia municipal courses John F. Byrne and Walnut Lane and served as the head of the golf department at the world famous John Wanamaker’s retail store in Center City Philadelphia. PGA Tour player-turned architect George Fazio renovated several holes during his years of ownership of the club from 1960 through the early 80’s. Local golf historians will remember that Fazio dueled with Ben Hogan and Lloyd Mangrum in a playoff during the famous 1950 U.S. Open at nearby Merion Golf Club. Tom Fazio, widely renowned as the world’s number one golf course architect, began his career in course design while working for his uncle George while the Fazio family owned the club. Mr. Fazio was our keynote speaker during our 100th anniversary celebration in 2013. Once known as Langhorne Country Club in its current location, recent renovations by Stephen Kay and Peter Fazio have made the layout play to a challenging 6,217 yards and a par of 69. Today’s layout is living proof that a classic golf course does not have to be 7,500 yards long to be challenging as uneven lies and small undulating greens dominate the landscape. World Golf Hall of Fame Member Ben Hogan watches as fellow PGA Tour player Joe Kirkwood Sr. warms up in the 18th fairway prior to their exhibition match. Hogan and Jimmy “Titanic” Thomson lost 1 down to Kirkwood and Langhorne CC host professional Al MacDonald on May 10, 1941. Exhibition matches featuring PGA Tour professionals and host professionals were commonplace in the 1930’s and 40’s. Three exhibitions are known to have taken place. One featured PGA Tour pros Ted Turner, Henry Picard, and Leo Diegel along with host pro Al MacDonald. A second included Tour players Picard and Vic Ghezzi along with MacDonald. The third and feature match was played at Langhorne CC as part of Philadelphia PGA Golf Week. 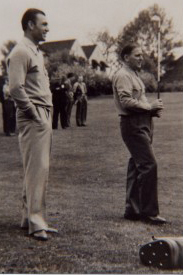 On May 10, 1941 the team of Al MacDonald and Joe Kirkwood Sr. (PGA Tour player and head professional at Huntingdon Valley CC) defeated Ben Hogan and fellow PGA Tour member Jimmy Thomson 1 up. MacDonald, the head professional for 29 years at Langhorne, also served as the President of the Philadelphia Section of the PGA from 1951-1952. Gary Player represented our club at the invitation of George Fazio during the beginning of his Hall of Fame career on the PGA Tour. Johnny Miller also played and fished here during his time in the Philadelphia area as his wife Linda is from nearby Hulmeville. We are extremely proud to say that five members of the World Golf Hall of Fame have played our course or have had some affiliation with our club. Hollywood actor Michael Douglas also played Middletown while in the area, along with Philadelphia sports heroes Bernie Parent (Philadelphia Flyers) , Charles Barkley (Philadelphia 76’ers), former Phillie Jimmy Rollins and 2008 World Series Champion Phillies manager Charlie Manuel. Former New York Giant and two-time Super Bowl champion Justin Tuck plays at our club when in the area. Middletown has played host to several high school and college golf teams through the years, including Neshaminy High, Conwell-Egan, George School, Bucks County Community College, and Cairn University. Current LPGA Tour member Brittany Benvenuto began her golf career at Middletown Country Club.